There are reasons that freshly made doughnuts are more popular than ever: the techniques are straightforward, and the rewards are sweet. 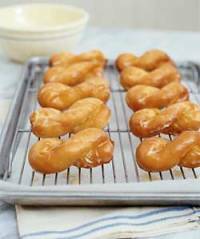 Tender, maple-glazed twists, delicately flavored with cardamom, make a wonderful edition to breakfast, or great for a coffee break, dessert, or a weekend brunch with the whole family. 1. In the bowl of a standing mixer or another large bowl, stir yeast into 1/4 cup warm (110°) water. Let stand until foamy, about 10 minutes. With a wooden spoon, stir in sugar, milk, and eggs (or beat in with paddle attachment); stir or beat in 2 3/4 cups flour, salt, and cardamom (dough will be soft and sticky). Stir or beat in butter, a few chunks at a time, until well incorporated. If using a mixer: Continue to beat at medium-low speed until dough pulls from sides of bowl, 4 to 5 minutes; add up to 1/4 cup more flour if necessary. Scrape dough down if it crawls up beater or sides of bowl. Remove beater and scrape clean. Scrape dough onto a well-floured board and knead briefly to bring together. If mixing by hand: Scrape dough onto a lightly floured board and knead until smooth and velvety, about 5 minutes, adding more flour as needed to prevent sticking. 2. Return to bowl, cover with plastic wrap, and let stand in a warm place until dough has doubled, 1 1/2 to 2 hours. 3. Scrape dough onto lightly floured board and press gently to expel air. Divide into 24 equal pieces. With floured hands, divide each piece in half. Form each half into a rope about 4 inches long and 1/2 inch thick. Twist the two ropes together, pinching ends together. Place twists about 1 inch apart on a floured baking sheet and cover with plastic wrap. Let rise until nearly doubled in size, about 30 minutes. 4. Meanwhile, fill an electric deep-fryer to the fill line or pour about 4 inches of oil into a 5 to 6-quart pan and heat to 375 degrees. With a wide spatula, gently slide two twists into oil, one at a time. Cook, turning once, until golden brown on both sides, about 3 minutes total. With a slotted spoon, transfer to paper towels to drain. Repeat to fry remaining twists. 5. When cool enough to handle, dip top half of warm twists in maple glaze. Place on a plate or rack and let stand until glaze is set, about 2 minutes. In a bowl, mix 1 cup confectioners' sugar, 1/2 cup real maple syrup, and 1 tablespoon milk until smooth. Soften butter in the microwave or at warm room temperature until very soft but not melted. You can make the dough the day before you fry the twists; cover and chill. Per twist: 173 cal., 40% (70 cal.) from fat; 2.4 g protein; 7.8 g fat (2.1 g sat. ); 23 g carbo (0.5 g fiber); 132 mg sodium; 25 mg chol. I prepared this recipe. It was very good!